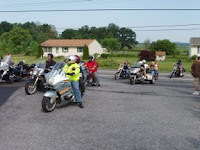 I attended the Lawn EMS "Third Sunday" breakfast ride-in yesterday in Lawn, PA near Hershey. Not only has the paved parking lot doubled since I was last there, the size of the crowd has increased by at least 100% as well. 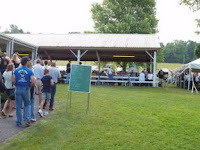 It wasn't unexpected by the organizers, as evidenced by the large tent erected next to the pavilion to accommodate the large throng of hungry riders. You can see in the photos (click 'em to enlarge!) that bikes overflowed into the grassy field adjacent to the fire hall. Kudos to Lawn EMS for providing plywood squares for kickstands! Cruisers were the majority, but there were also some nice sport-tourers, adventure-tourers and plain ol' tourer-tourers, too. I arrived at about 0830 and the food line was already about 20 minutes long; a wait made bearable by good company. 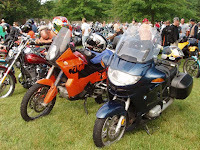 I don't know how many attended, but a steady stream of motorcycles were still rolling in at 0930 and when I left at about 1100 there were just beginning to be a few empty spots in the front parking lot. It appears this event is taking off big time! 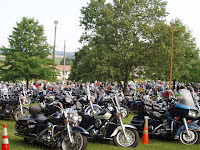 It's in a nice location reached via back roads, it's very well organized and benefits a worthwhile cause, and has very good chow...what's not to like? Make plans to attend if you haven't yet!